Progress has been challenging with this year’s Winter patterns and plentiful snowfall. We fault Punxsutawney Phil for his mistaken early spring prognostication! However, spring looks to be here, and project Superintendent Randy Frahm is working diligently to push progress to full throttle. Storm shelters have been poured and plumbing ground rough-in has begun. 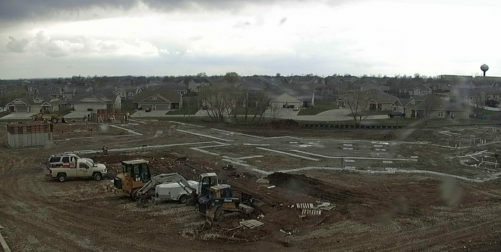 As you can see from the picture above taken April 4, the outline of the building’s footprint has been poured and the scope of the size of the project is evident.